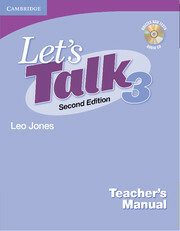 The Let's Talk 3, Second Edition,Teacher's Manual has been enhanced and expanded to offer increased support and flexibility. Included are detailed teaching notes, clear learning objectives for every activity, teaching tips, expansion activities, and writing options. Provided as photocopiables in the back of the book are model conversations for discussion support, talking points for additional speaking practice, and a complete assessment program including quizzes and tests. The Audio CD packaged with the Teacher's Manual provides all the listening sections for the assessment program. 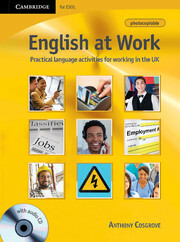 A photocopiable resource book designed to prepare learners for the world of work.